Built in aluminium by German yard Abeking & Rasmussen to a design by Tom Fexas, she was delivered in 1985 and had a massive refit at Delta Marine in 2009, reportedly costing in excess of $12 million. Accommodation is for 11 guests in six cabins consisting of a master suite, VIP suite, two doubles and two twins, all with entertainment centres, television screens and en-suite bathroom facilities. The main saloon is finished in high gloss pear wood with settees to port and starboard and two games tables, each with four chairs, while access to the aft deck is through two sliding glass doors. There is also a sophisticated entertainment centre including a plasma television screen and a Denon stereo surround sound system. The dining area is open to the main saloon and has extensive storage for crystal, china and silver dinner ware. The aft deck of this yacht for sale is sheltered by the sun deck overhead and has a teak table with seating for eight to starboard and a settee opposite to port. A spiral staircase leads to the boat deck and flybridge and access to the swim platform is via a central stairway. Up on the flybridge is a control station forward with seating on both sides, a massive port side seating area with two tables that join for dining 12 people, and sun loungers and easy chairs opposite to starboard. Aft is a Jacuzzi tub with an adjacent bar, refrigerator, ice maker and a service area. Twin 1,635hp MTU diesel engines give her a range of 5,500 nautical miles at 10 knots. 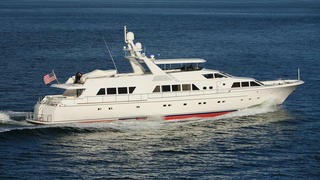 On display at the Fort Lauderdale Boat Show, No Buoys is now asking $6.9 million with US duty paid.